Still preparing for Spinzilla, this is part two of my drafting experiments using this prepared wool from Curtis Wools - it's really easy to spin and does half the work. I read somewhere recently about someone splitting their fibre and pulling it through a diz. 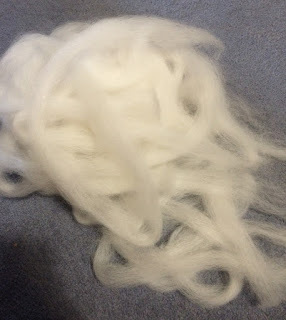 Because I want a nice, smooth (non-woollen) and relatively fine yarn for this project (below) this could be a fast way to make the yarn and be a suitable job for the Spinzilla week. 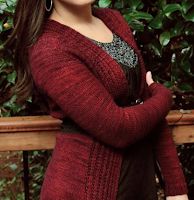 The cardy I want to make uses sport-weight yarn, that'll be a long knit! I found the diz a bit clumsy, but splitting the yarn down several times and then pre-drafting by hand in the usual way took no time and made the top ready to spin very quickly and evenly. 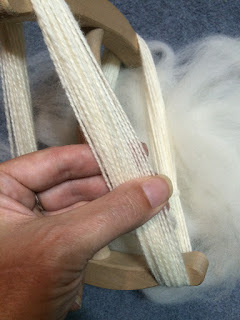 The resulting two-ply yarn may be a little too fine, I'll measure the WPI after washing and try a swatch. I could go three-ply for a very even yarn, or just spin a little thicker.